Major book retailer Borders disagrees with the claims of new eBook manufacturer Interead's recent claim that we were at the 'iPod moment' for eBooks and electronic publishing. Borders has followed Waterstones' lead launching a new electronic book download store in the UK this month, though the company does not see eBooks cannibalising traditional book sales. "The majority of searches that are being done for e-books are actually buying for the over-55s," Julie Howkins from Borders told the BBC. "It is the older members of the population who perhaps have a bit of spare capital. "Publishers are beginning to take notice but I don't think we have reached the music i-Pod moment for books at all," the Borders rep added. "You would never get the same experience browsing through the shelves and being able to see books that you didn't know existed. "I can't see Borders being a huge bank of computers, that's not the way it's going to go." 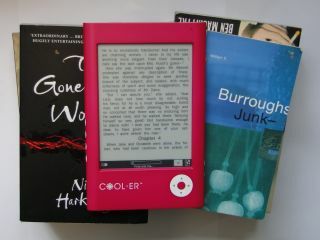 Interead is gearing up to launch the new Cool-er eBook at the New York Book Expo later this month. You can see TechRadar's exclusive hands on with that device right here. Amazon is looking to launch its popular Kindle electronic book in the UK later in 2009, although the online retailer has recently been causing controversy in US book publishing circles, due to its aggressive price cutting of new eBooks, putting the electronic versions of the latest hardback favourites out as eBooks at a loss leading $9.99! Stephen Bury, who is responsible for the British Library's European and American Collections estimates that there is currently "about a million Kindles in the world" and "probably about three-quarters of a million Sony Readers out there."